These two dragons are nuzzeling, their tails entwine, and the space between them forms a heart. We designed this to top a wedding cake, but it makes a wonderful sculpture as well. (On a cake, the base will be covered with frosting or flowers.) 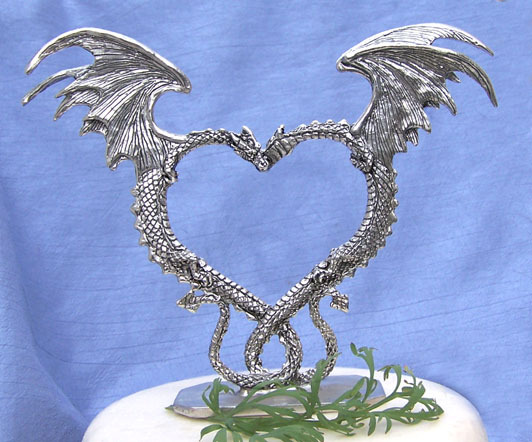 We make it by hand from lead-free pewter and it is 7 1/2 inches across from wing tip to tip. This item is often used as wedding cake topper but can be used for any other special occasion.